Well to be honest he's not that little any more, he's 5 on Monday and now weighs 18kg! Unfortunately he's not always as smiley as you see him in our blogs and social media accounts. As well as having disabilities which include Cererbral Palsy Macsen has a lot of medical problems. These problems are very complex to deal with, impact each other and all are worsened by the huge mixture of medications, which are constantly being changed as we try and keep up with his evolving conditions. Over the last 5 years I've tried to keep track of lots of metrics about what's happening in the hope I can find a pattern. I've tracked how many seizures, the intensity, what regular medication given, how much rescue seizure medication, and even how many poos per hour! I've been tracking plotting and looking for patterns constantly using scraps of paper, industry templates, my own paper forms and lots of spreadsheets. I'm not sure I've ever got it right and every time I change format I lose a load of data, patterns and maybe the answer! I recently found out about an awesome website which Feels like exactly what I've been searching for! Bobath Wales invited me to a training session last week run by Dr Nicky Harris. 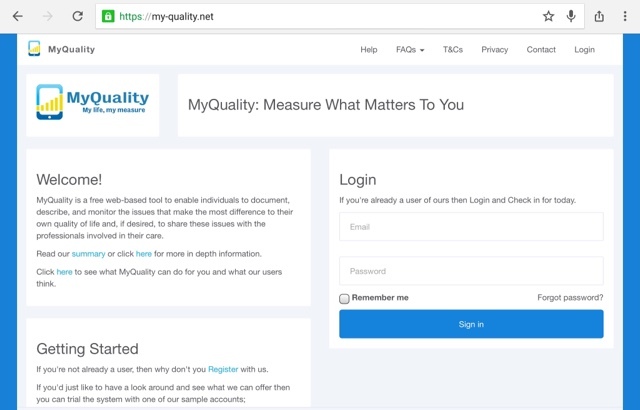 Nicky (it always seems weird referring to a Dr without the Dr) has specialised in Palliative Care for many years and it seems our family is not unique with this problem as she spotted this need and with her team they created a tool called http://my-quality.net! http://my-quality.net is a secure service run from a UK datacentre funded by the NHS and other groups. 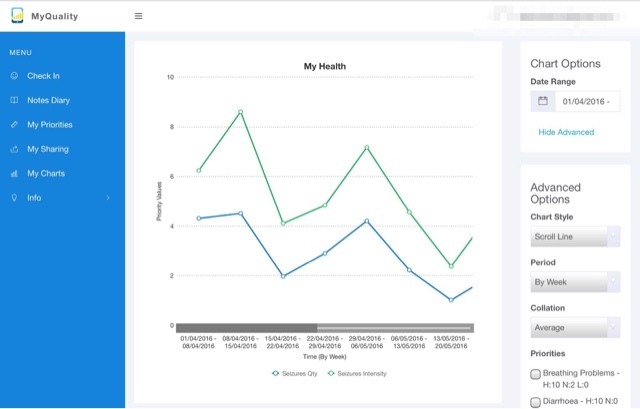 It allows children (where they are able) and their families to log how their symptoms are evolving and share the findings with their consultants! Right, that's enough preamble, let's get on to showing you what it's all about. The most important thing is the landmarks at the bottom. This is where you define on a scale from 0 to 10 what is good to bad. You can imagine how this would be very different for someone who regularly has seizures that could last 30 minutes or someone who needs to categorise between absences and tonic clonic seizures. 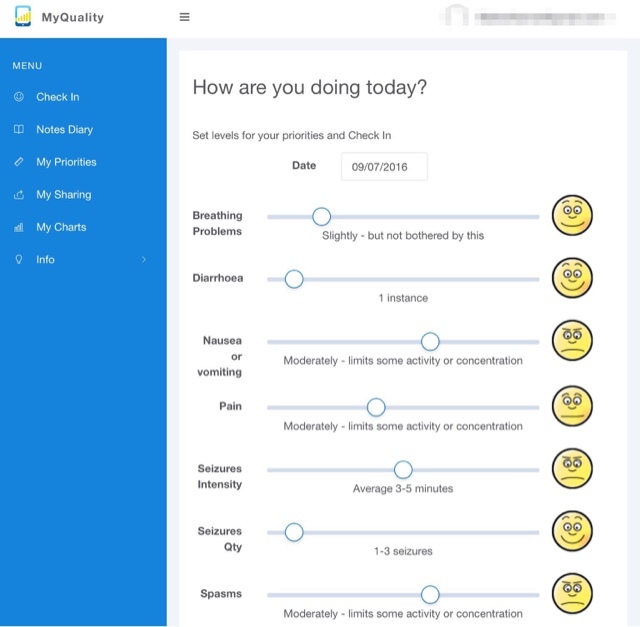 Once you've setup your Priorities (these can change and evolve over time), you then simply login daily and move a few sliders to log symptoms have been like that day. The beauty of this is it's simplicity. 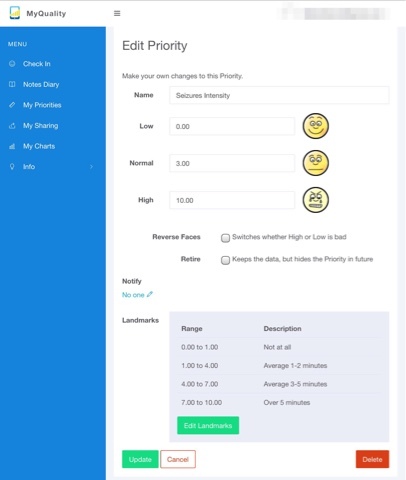 As you move the slider from left to right the smiley face turns sadder and more distressed; also the text below changes inline with what you defined in your Priorities. It's this text that ensures consistency and that a 6 in January 2016 is the same as a 6 in June 2018. The important thing to remember is that this tool allows you to securely share this information with the specialists involved in your child's care. I've already linked up with one of our consultants and one of our nurses, but I've invited all of our key specialists. 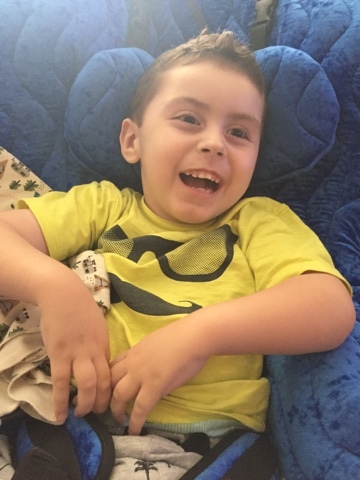 I hope together we will find the right pattern, get Macsen's symptoms under control so we can focus on fun rather than appointments.